We know dallisgrass control is a concern for North Texas homeowners. Dallisgrass is often mistaken for crabgrass. This weed grows in clusters that are often taller than the surrounding grass. It is drought tolerant and thrives in North Texas lawns. Along with nutsedge, dallisgrass is one of the more difficult weeds to control. 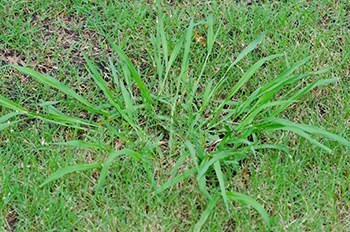 Once dallisgrass arrives in a lawn, it may require several applications to get it under control. There are no products available that will prevent dallisgrass from germinating. The best way to keep dallisgrass under control is to keep it from going to seed. This weed develops seed heads very quickly. It is good practice to mow at least once per week to keep it from spreading. The Weedex residential lawn care program includes spot treatment of summer grassy weeds with regularly scheduled applications. These dallisgrass control treatments are only effective when applied in the fall as the plant begins to shut down and store energy for the winter. If dallisgrass is a prevalent problem throughout a lawn it may require two blanket applications. Additional information regarding dallisgrass control can be read here. *Dallisgrass cannot be treated in St. Augustine or Zoysia grass. We want all customers to know what to expect with our dallisgrass control. Expected results from our specialized applications are 60% to 80% control over the course of the fall. Depending upon the severity, it can take up to three years to fully eradicate dallisgrass from your property. Note that a blanket preventative treatment cannot be applied to St. Augustine or Zoysia. Get Started with a Free Quote or call 972-727-9207. Stay in touch. Find us on Facebook.